On Saturday, January 27th, the People’s Open Network held our fourth Build Your Own Internet Workshop (BYOI). By far our biggest and best yet, the event drew over a hundred people from all over the Bay Area to the Omni Commons for an afternoon of talks and hands-on demonstrations. In case you missed it, you can read the recap below or watch the recording of the live stream https://www.youtube.com/watch?v=WuuE8lHgP5c. BYOI was kicked off with Jenny Ryan who welcomed and introduced all the attendees to the space. Jorrit Poelen followed that with a short talk on what the idea of “building your own internet” meant to him. 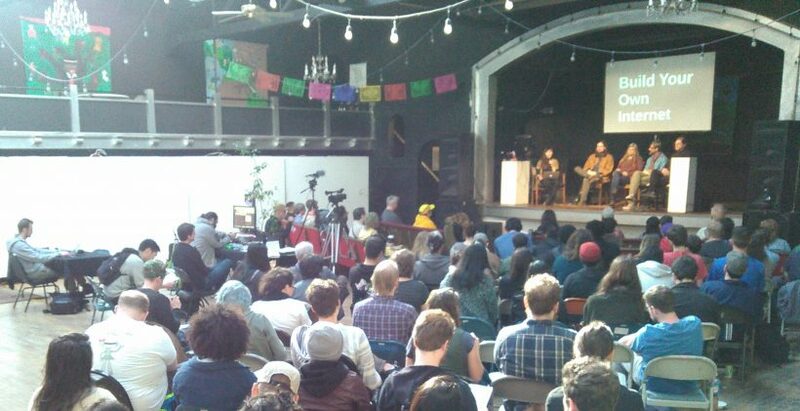 Then, MC and moderator, Mai Sutton, set the stage for the panel discussion by presenting facts about internet access in Oakland and recounting the fight for net neutrality. Despite “collapsing barriers of time and space”, Mai explained, that the internet as currently conceived has stopped working for the people who need it most; minorities and people of color who have been locked out of the tech economy. The panelists were then asked to introduce themselves. The panel included Preston Rhea of San Fransisco-based Wireless ISP, Monkeybrains, Tracy Rosenberg, executive director of Media Alliance, Shahid Buttar of the Electronic Frontier Foundation, and Tim Pozar of San Francisco community fiber network, Community Broadband Network. Mai shifted the discussion to focus back on community networks, asking the Tim and Preston to define the term “community network.” Tim explained that most of the problem existed in the last mile, that is the pipe from your street address to the data center, and that a community network is something that would bypass the last mile. Preston expanded on Tim’s definition, holding that community networks are necessarily liberating. Furthermore he argued that in a capitalist-ruled class society, community networks are inherently anti-capitalist. Shahid disagreed stating that “community networks are not necessarily anti-capitalist,” citing an example in Idaho, where a municipal broadband Both Shahid and Preston reiterated that the challenge of community networks is a social and political one. Tracy, Tim, and Preston enumerated a number of successful community network projects from Tim’s Community Broadband Network to Chattanooga Municipal Broadband to initiatives in Detroit, MI and Red Hook, Brooklyn, NY. To finish the discussion, Mai asked whether the panelists were optimistic or pessimistic about the future. Shahid seemed optimistic bringing up the continuing fight for net neutrality. Tim continued Shahid’s point that net neutrality rollback could be reversed, if community networks become a viable alternative. Tracy was optimistic that some areas could develop community networks, but others more rural areas may find it more difficult, resulting in a patchwork of accessibility that might resemble a digital divide. Preston, ever the pessimist, stated, “the internet is dying,” but that there was some hope in the form of alternatives given the right resources and effort. 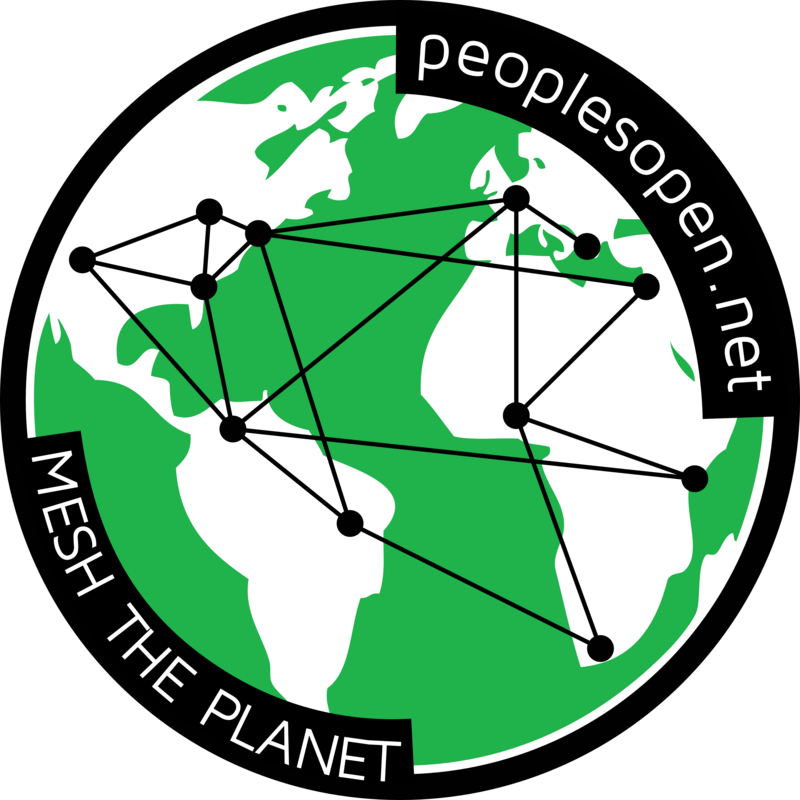 However, the event was not over yet, we had a number of tables set up around the ballroom where people could learn about the different projects being worked on by Sudo Mesh and People’s Open. People’s Open brought out their “internet-in-a-box” demo that allowed people to connect to Chicken and Cow’s website over a miniature mesh. The Chicken and Cow looked a lot like Raspberry Pis connected to home routers, but I suppose they were expecting people to suspend their disbelief. Perhaps the most exciting demo (maybe I’m partial since I was hosting the table) was the disaster.radio live range test, in which we successfully transmitted a message 2.6 miles across the city of Oakland using just two low-power, roof-mounted prototypes. Learn more about this project at https://disaster.radio. Garden Mesh once again was on display with a very healthy-looking mate plant that was having all its data sucked up by a little Garden Gnode. Learn more at https://peoplesopen.net/gardenmesh. The People’s Open Network’s analog map was also back in action, showing people where we currently have nodes and how they might be able to connect to them. And, of course, we had the fan favorite hand-on stations with crimping and button making. All in all, we’d deem this Build Your Own Internet Workshop a great success. Make sure to keep an eye out for our next workshop, or volunteer to organize and host one in your community, we’re looking to encourage others to hold BYOI workshops in their neighborhoods.